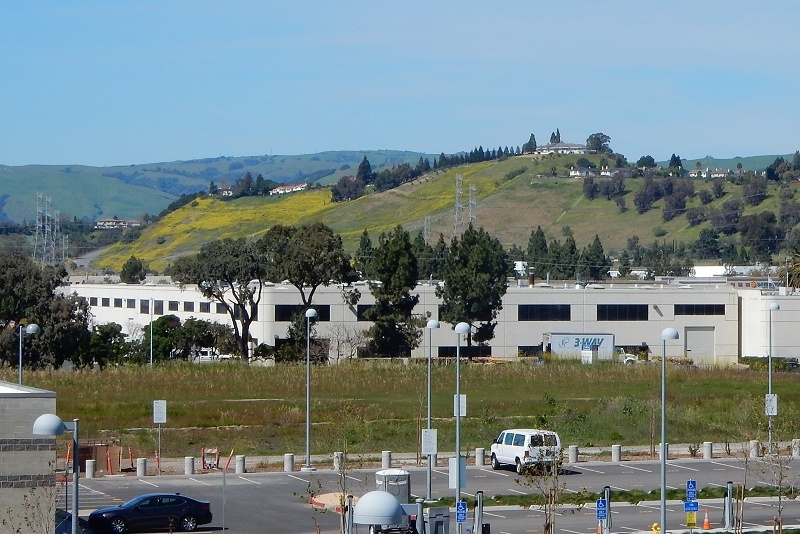 Every extension of BART opens up a new region accessible to geologizers using public transit. So the other week I paid a visit to the far end of the Hayward fault, less than a mile from the new Warm Springs station in south Fremont. 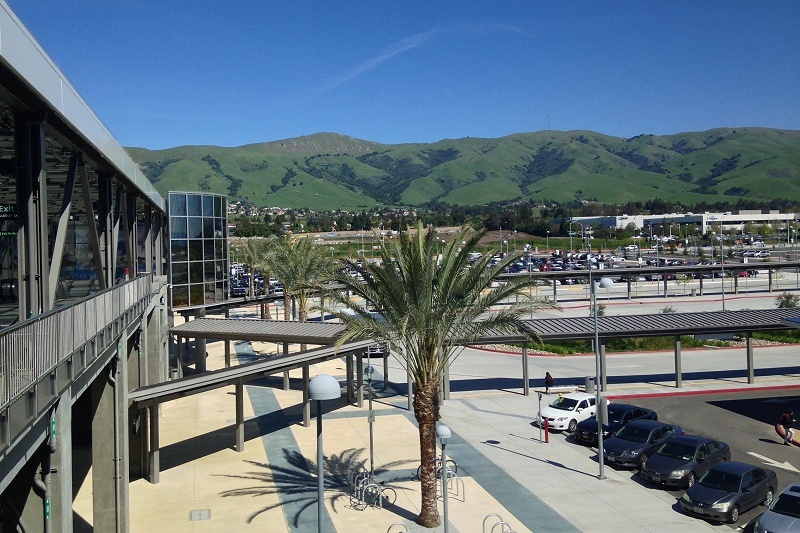 The station has nice views of the San Mateo Peninsula mountains to the west and Mission Peak to the east. It appears, too, that the Irvington Gravels site to the north is accessible for determined walkers who bring provisions — that is, hikers. 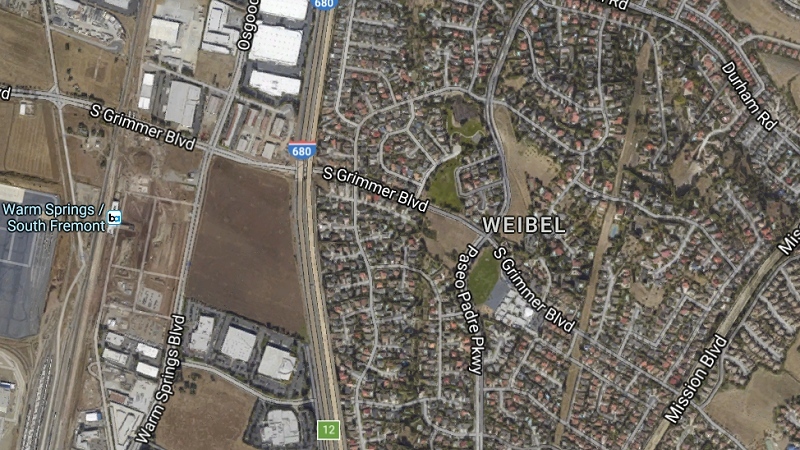 To get to the fault just walk east on South Grimmer Boulevard toward the place marked “Weibel” on Google Maps. Here’s the same area in Jim Lienkaemper’s detailed 1992 map of the fault. 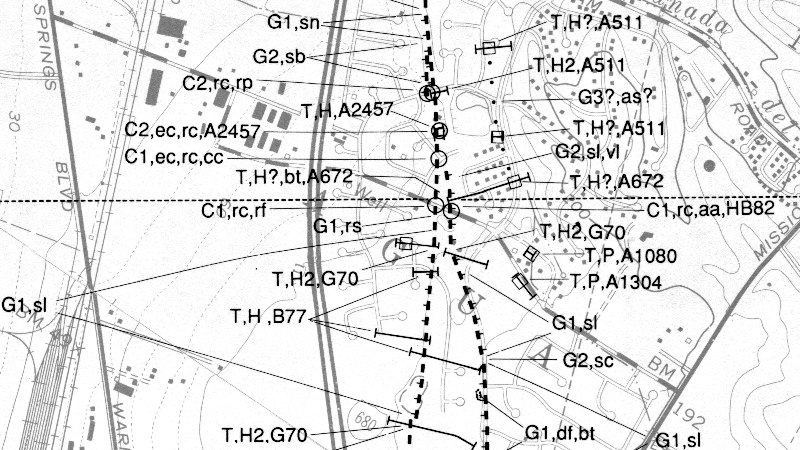 The map has a key to all the annotations. Note that both images are tilted to make the fault vertical; north is at about 1:30. Look back at the Google Maps image. See the line of green along the fault trace? That’s because of the 1972 Alquist-Priolo Act, which forbids new construction within 50 feet of an active fault. The area in the middle must have been built up before the act took effect. That’s where I went. South Grimmer reveals the offset from fault creep well. This view is looking east toward Mission Peak. On the fault map, the locality (just below the horizontal dashed line) is circled and labeled “C1,rc,rf” signifying “strongly pronounced” evidence of creep in the form of right-offset curbs and a right-offset fence line. And this is the other side of the road, looking west. 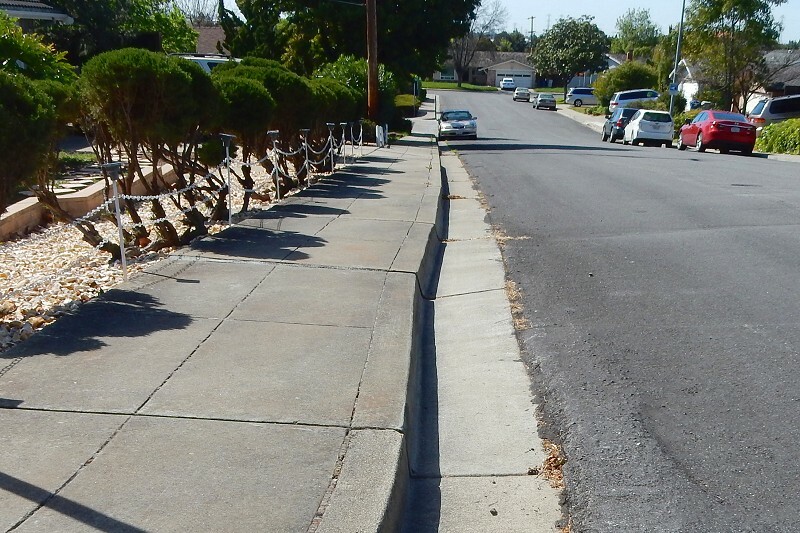 Notice that the sidewalk is offset as well as the curb. There’s another, much smaller offset higher up the slope that I didn’t get a good picture of. Repeated measurements show that together these offsets add up to about 6 millimeters per year. The slope itself is a sign of the fault, too. To the north across little Arroyo Agua Caliente Park on Gardenia Way, this nice set of echelon cracks marks the fault trace. That’s what the “ec” in the circle labeled “C1,ec,rc,cc” stands for. The fault nips the corner of Gardenia and Ivy Way, bending this curb (the “rc” in the label). 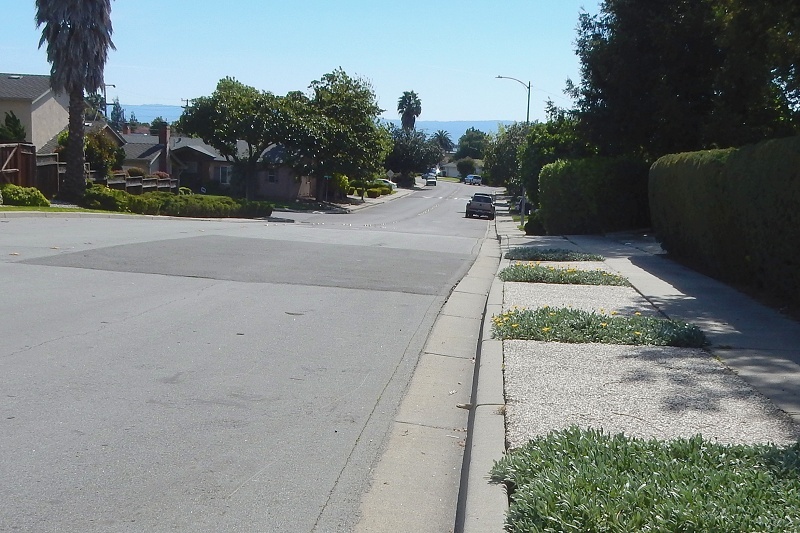 The city or the homeowner copes with the sidewalk by patching it as needed. 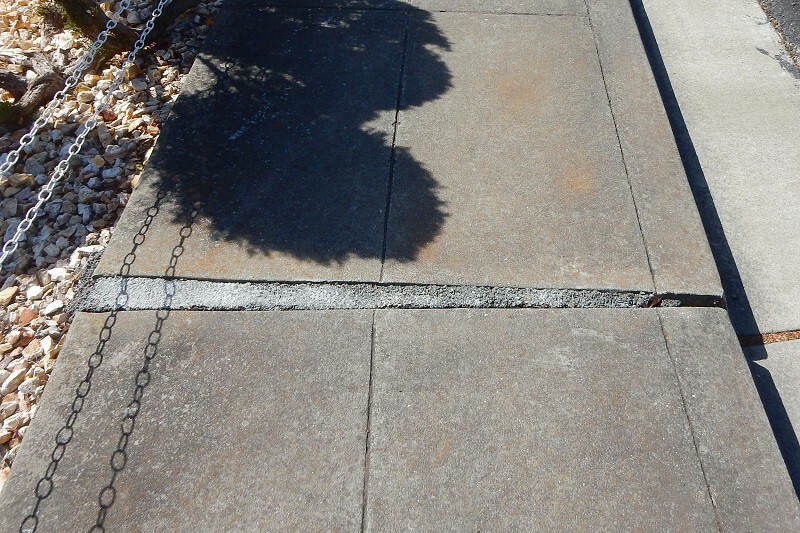 You’ll see stuff like this everywhere on the Hayward fault. 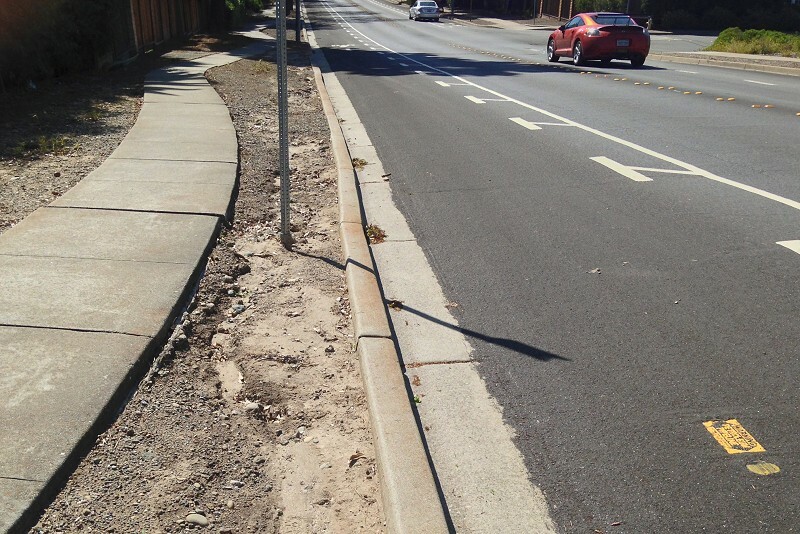 Walking north through the park to Parkmeadow Drive on its north edge, you can look west down the street and see both an offset curb and the change in slope that marks the fault. You can do this yourself all along the fault. The map has all the evidence (and the USGS has an updated version as of 2008). 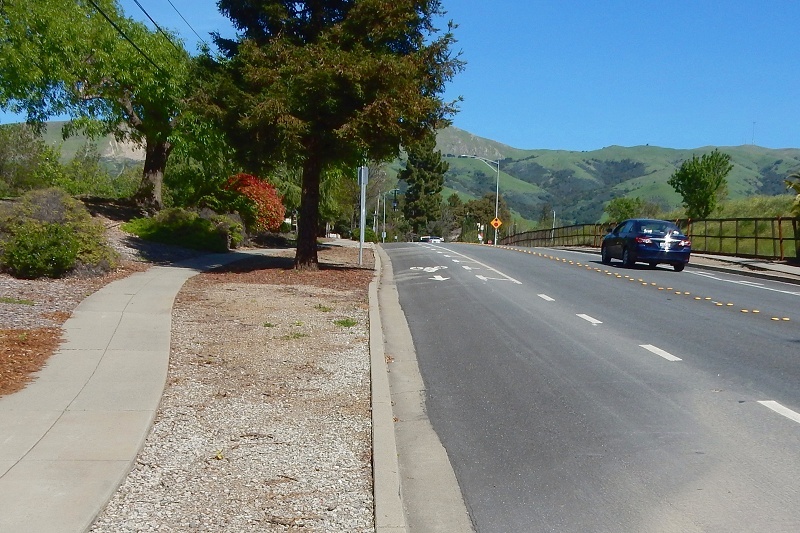 A week later I hosted two French journalists — a writer and a photographer — for an afternoon, showing them fault offset features like these up in Hayward and Oakland. 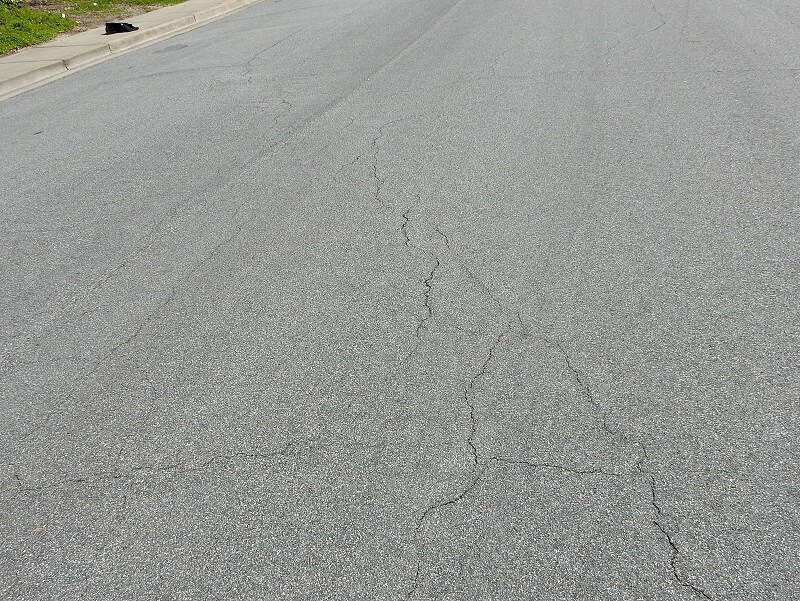 The writer went and spoke to a resident whose home was on the fault, and his fatalistic response took her aback a bit. She said “we don’t have attitudes like this in France.” I told her we Californians have been this way since the Gold Rush. This entry was posted on 17 April 2017 at 8:02 am and is filed under The Hayward fault. You can follow any responses to this entry through the RSS 2.0 feed. You can skip to the end and leave a response. Pinging is currently not allowed. Thanks for this! I’m fascinated by the local faults. We live in Martinez near the high school, and there are two faults between our house and the Hayward fault–the Southampton fault and the Franklin fault. To the east of us lies the Concord fault. I’ve noticed, though, how the hills due west toward the bay rise steeply as if out of nowhere. I traced the Southampton fault on a map and learned that it’s just on the other side of the first set of these hills. Do you know much about the Franklin and Southampton faults? The Southampton fault, on a map, appears connected to the Napa fault. I’ve researched both faults, but there doesn’t seem to be much information about them.